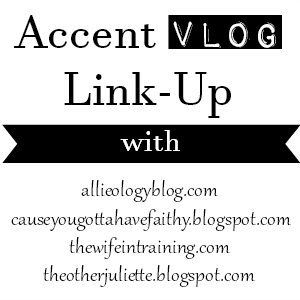 So I thought it would be fun to participate in the Accent Vlog link up with The Other Juliette, Allieology, Cause You Gotta Have Faith, and the Wife in Training… even if I am a few days late. Oops. This also happens to be my very first vlog, so go easy on me. So what do you think? Do I have an accent? This is SUCH a great idea! I’m sad I missed the boat on it… maybe I will randomly throw it out there later this week! And we call those little bugs that roll into balls, roly polies. Crazy right? Never too late! I highly recommend participating if you can :) I love hearing everyone’s “real” voice! You DEFINITELY have an accent! And I agree with Jamie – everyone that doesn’t have a north/south accent sounds the same to me! The two things that stuck out the most is the shopping cart – I call it a buggy LOL and that you pronounced roof properly – it’s not ruuuff. This was so cute and awesome! Thanks, Ash! So funny you call it a buggy! I don’t think I’ve ever heard or noticed that around here! I looove hearing other blogger’s voices!! You are so cute, and have a real talent for vlogging, you didn’t seem nervous at all. I hope you will so more blogs in the future, that was awesome! Haha, I just pretend I’m talking to someone I know and it’s not so terrible. I did have to hype myself up – it’s easier to talk to a real person than just a screen! :) Apparently people enjoy the vlogging, so maybe I’ll make it a regular thing… hmmm, I smell a link up! this is the best thing ever! i loved this so much. i totally want to do this! anywho, people in melbourne say ‘pellow’ as well. funny! Oh that’s too funny! I’m glad I’m not alone. You must do it, I would love to hear your accent! This is a funny linkup! I’m Italian so my accent is quite evident ehehehe. I’m stopping by via #fabfavorites linkup and I’m your newest follower via Bloglovin. Hope you will follow back, so we can stay in touch! Yes you should! The more the merrier, I love creeping on everyone’s vlogs, and I’m so curious to hear your accent!! Fellow Washingtonian here! I just started following your blog and caught this blog before I realized you are from Seattle too! I can totally relate with a few things like the Potato Bug. If you say that name in California (where I live now) people will freak out. It’s a gnarly bug that is not as cute as our Potato Bugs, but Californians calm them Roly-Polys. Weird! Also – I was converted to saying soda instead of pop because Californians also freak out a bit when they hear pop. I think that’s where we get the mid-western comment from. I’ve also been told I have a midwest/southern accent, so I think We’re a Midwest state on the west coast. :-) I’m also from a small Washington town called Sedro-Woolley, so that could explain part of it.